Madison Shipley is a Fisheries Analyst at NRC with Bachelor of Science degrees in both Aquatic and Fishery Sciences and Oceanography from the University of Washington. 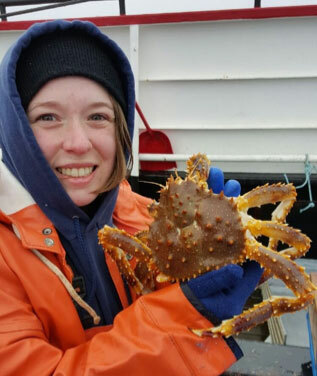 Madison works on projects involving population assessments and distribution of commercial and ecologically important species, primarily focusing on Alaskan Crab with the Bering Sea Fisheries Research Foundation (BSFRF). Madison has completed field work for the annual crab surveys over the last three years, including projects that occur in conjunction with NMFS. During these projects Madison is responsible for field supervision, data acquisition, performing preliminary analysis, and creating spatial summaries. This information is utilized for stock assessment models and management decisions. Madison is proficient in statistics, ArcGIS, and is pursuing graduate school for stock assessment modeling at UW while continuing at NRC.